What are the secrets of a successful loyalty program? During last week’s MPMA (MN Petroleum Marketers Association) Convention and Trade Show, I ran across a copy of Convenience Store Decisions near the front of the exhibit hall entrance. In it, I read a story about the evolution of loyalty programs. Previously, loyalty programs were simply an added perk to the shopping process. However, consumers today have very particular expectations from the loyalty programs they choose to participate in on a regular basis. And a good loyalty program has the potential to pull a consumer from a competitor – even if that consumer has lower fuel pricing. So, what are the characteristics of a loyalty program consumers want? According to a LoyaltyOne survey, approximately 55 percent of surveyed customers say the most important aspect of a loyalty program is the ease of redeeming rewards. Waiting in line for the person in front of you to complete his or her ten minute transaction is usually not the ideal end to a shopping experience. Make it quick to access member accounts and easy to clerks to select the reward the customer wishes to use. More than half of those who participated in the survey indicated they have an interest in monetary rewards and the ease of earning points. And really… who doesn’t like to receive cash? It’s an easy way to provide a discount that gets customers back in the door. Gift cards are a great way to make sure they come back to YOUR location. Or, simply offer a spend program like spend $200 get $20 off another purchase. Easy enrollment is a priority for about 25 percent. Make sure your employees are actively engaging customers to participate. Customers want to know the benefits of the program along with how easy it is to enroll. And be sure to have options for your customers like in-store and online enrollment as well as communication by text, email, or both. Access to exclusive deals and coupons is a major factor for 36 percent of customers. A targeted audience builder comes in handy for this once you learn who your best customers are and when they do their shopping. For example, you can send an email or text promoting a 5-hour ENERGY Shot that must be redeemed in X days. Or, when you get the item in people have been asking about… let them know! It’s no wonder why loyalty program memberships are still growing! 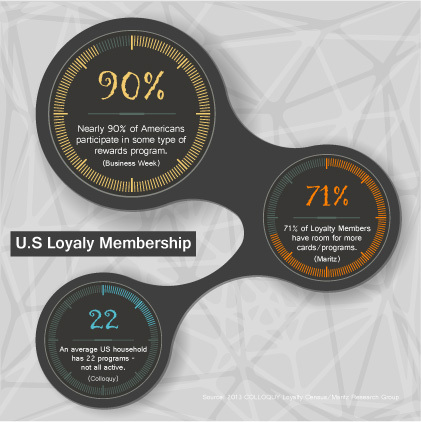 Although Colloquy’s Loyalty Census shows loyalty program memberships in the US topped the 2 billion mark in 2010, there continues to be an increase in people signing up for more and more programs. Since then, there are a whopping 2.6 billion loyalty program memberships out there – an increase of about 25 percent! So, don’t expect consumers to suddenly fall of the bandwagon anytime soon. You just have to be sure it’s a simple program that truly benefits the consumer (and you). That’s the kind of program that stands out from the crowd.